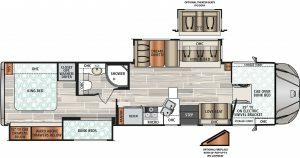 A look at this Type C motorhome model and the 37BH HD floor plan in particular. Star Wars movie fans know the famous line, “May the Force be with you.” RVers ensconced in the Force HD motorhome from Dynamax Corporation may heed that same call as they conquer the road. The Force HD, a Type C, seats and sleeps multiple occupants. Yet this model goes beyond the basics. Its Freightliner M2 106 chassis boasts a 33,000-pound gross vehicle weight rating (GVWR), enabling passengers to carry seemingly all the gear, groceries, and goods they need on the go. A Cummins 8.9-liter 350-horsepower ISL turbo-diesel engine with 1,000 pound-feet of torque provides the motive power, assisted by an Allison 3200 TRV six-speed automatic transmission. This unit also offers 20,000 pounds of towing capacity. Safety-conscious RVers will want to note that the Freightliner M2 is an automotive, crash-tested chassis said to offer up to 5 feet of crush zone protection. The front cab, with a distinctive chrome grille, is made of corrosion-proof aluminum reinforced with e-coated steel. The hood is equipped with gas struts for easy engine access. A “muscle-car-style coach” is added to the cab platform. The coach body is constructed with 2-inch aluminum-framed, laminated sidewalls insulated with block foam and joined to aluminum-framed floor and roof trusses. Gel-coat fiberglass forms the exterior walls. Fiberglass also is used for the front and rear caps; front wing panels; and crowned, one-piece roof. Foil-lined ductwork runs throughout the vehicle. The Force HD rides on Michelin XZE2 275/80R 22.5 tires with aluminum rims — single front wheels on the 12,000-pound-rated front axle, and double wheels on the 21,000-pound-rated Quiet Ride Rear axle. Ride and handling are augmented by Bilstein gas-charged front shock absorbers and a front sway bar. The coach has air brakes with four-wheel ABS, plus a dual-stage C-brake by Jacobs. Automatic four-point hydraulic leveling jacks facilitate camp setup. Custom full-body exterior paint is applied to all Dynamax motorhomes. The entire process occurs in a dedicated, state-of-the-art paint facility at the company’s production headquarters in Elkhart, Indiana. This enables technicians to focus on details, and thus control quality. The 2019-model Force HD comes in five exterior paint schemes: Admiral Blue, Black Mirage, Cabernet, Desert Mirage, and Magnetic. Once all trim and accessories are removed, crevices are sealed, sanding is done, and windows are taped, technicians apply high-quality BASF paint. After multiple layers of color, drop shadows, and sealer coats, a final cut-and-buff process removes microscopic layers. The result is a smooth, mirrorlike finish. Thanks to airbrushing and hand-taping paint lines to match body contours, no two paint jobs are exactly alike. 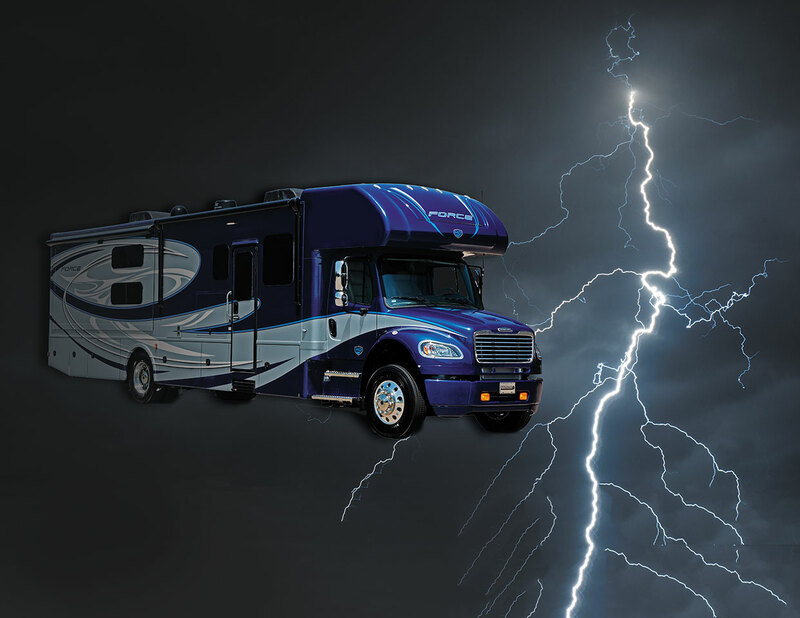 Motorhome utilities include two 12-volt 4D AGM deep-cycle batteries; 50-amp electrical service with a power cord reel; dual ducted, 15,000-Btu low-profile air conditioners with heat strips; a 40,000-Btu propane-powered furnace with electronic ignition; and a 60,000-Btu Truma Aqua Go Comfort on-demand water heater. At press time, the Force HD included three floor plans for 2019 — the 34KD HD, the 37TS HD, and the 37BH HD. 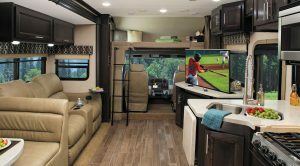 The 37BH HD, pictured in this article, contains a street-side slideout in the living area and a second curb-side slideout that houses bunk beds and cabinetry. 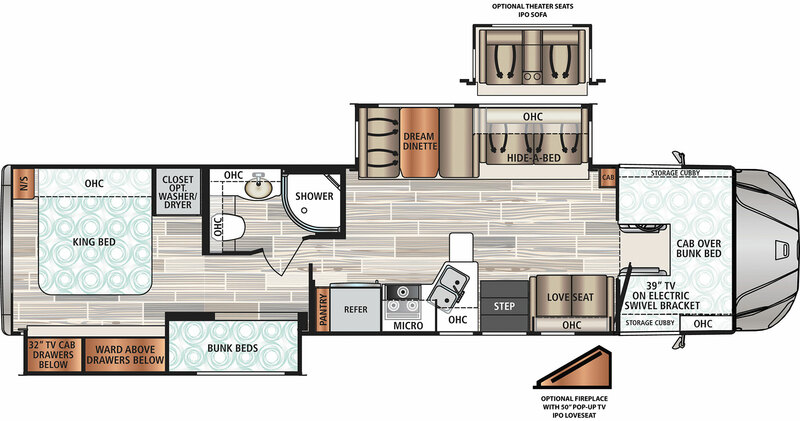 The two-slideout 37BH floor plan incorporates a front cab-over berth, a sofa bed, and a convertible dinette, plus bunk beds and a master bedroom in the rear. The Force HD’s interior is roomy and welcoming, with upscale contemporary décor. Shaker-style hardwood cabinetry comes in two colors: Driftwood or a darker Caramel. Three décor choices are available. Vinyl flooring is used throughout, augmented by carpet in select slideout areas. Day-night shades provide privacy and light protection for the dual-pane, dark-tinted frameless windows; the front window is outfitted with thermal, reflective front privacy shades. Entertainment features in the living area include a 39-inch LED TV on a swivel bracket, and a JBL 2.1 sound bar with a Smart Blu-ray player. An optional fireplace with a 50-inch pop-up TV replaces the smaller TV in two Force HD floor plans, including the 37BH HD. The galley is nicely outfitted with a 16-cubic-foot double-door residential refrigerator with ice maker, a gas range with solid-surface covers, and a convection-microwave oven. This area includes solid-surface counters and covers for the double-bowl stainless-steel sink. The bath is just aft of the galley. The vanity features another solid-surface counter, which secures an under-mount sink and residential brushed-nickel faucet. A fiberglass shower, topped with a skylight, is enclosed by a rounded glass door. The aforementioned king bed in the rear is graced by a padded headboard and a designer bedding package. Nightstands with solid-surface countertops flank the bed. LED reading lights provide illumination when relaxing with a good book. A 32-inch LED TV is also located here. A long list of standard features fill the Force HD, including the following: water filtration unit, USB charging ports, a holding tank vent cap to eliminate gases and odors, an LP quick connect for use with a portable grill, and MaxxAir vents with rain covers and remotes. All Dynamax motorhomes come with a two-year limited warranty. And for answers to questions any time they arise, online owners manuals are available. Or try the free mobile app for both Apple and Android devices.